When winter’s glacial groan begins to sweep across the land, animals are ready to meet the challenge with a variety of strategies. The monarch butterfly migrates to warmer retreats, the black-capped chickadee braves the blizzard and squall, the little brown bat hibernates in cavernous refuges, the gray squirrel organizes its cache of nuts, and the black bear falls into a deep torpor. But the wood frog neither flees nor flops nor frets…it freezes. A wood frog (Lithobates sylvaticus) dares to hop the fine line between life and death. As the autumn air chills, it tucks itself beneath an insulating layer of forest leaf litter, crouching into the universal frog water conservation position to prevent desiccation. Yet wood frogs have more to worry them than low humidity. The frost that soon greets every morning illustrates a major hazard of winter. When water freezes it forms a crystalline structure which can rupture and dehydrate cells. Like a monk in meditation, the wood frog welcomes this danger into its sanctuary and transmutes it, but how? The frog’s liver churns out glucose, which is shuttled into its cells, lowering its freezing point. It also holds its urine, raising levels of plasma urea, a potent cryoprotectant. Meanwhile, ice growth is encouraged in extracellular spaces where it will not cause damage. Nucleating proteins in the blood seed ice crystals, which spread throughout the frog’s arteries and veins. Its heart beats slower, and slower, and eventually…it stops. At this point, there is no sign of life. No heartbeat, no breathing, no brain activity. 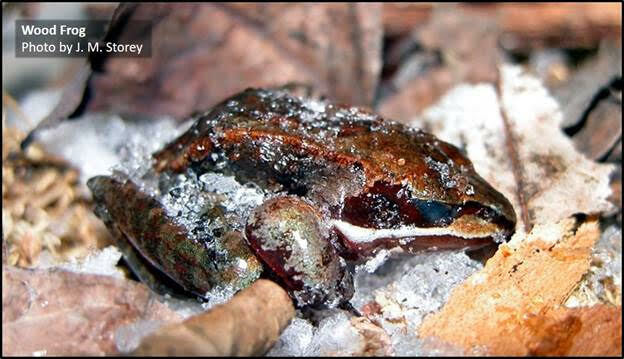 The wood frog is frozen solid, yet very much alive. This process is so robust that wood frogs can survive the many freeze-thaw cycles that come with fickle winters and reluctant springs. However, it is not without peril. If temperatures dip too low, the frog will die. The farther north the wood frog population, the lower the temperature the frogs can tolerate. Frogs defrost from the inside out. Come spring, their hearts resume beating approximately 30 minutes into a thaw. While other amphibians are still slumbering underground or beneath ice covered ponds, the wood frog gets an early start breeding in meltwater vernal pools. 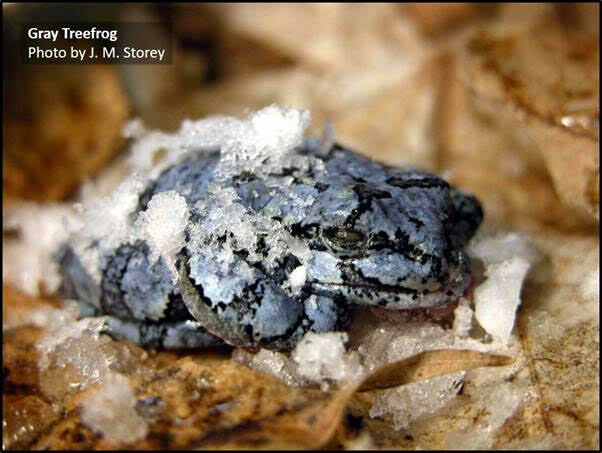 Other freeze-tolerant frogs commonly encountered in Pennsylvania include the eastern gray treefrog (Hyla versicolor) and northern spring peeper (Pseudacris crucifer). This miraculous winter strategy holds medically important secrets, which one day may aid cryopreservation of organs, management of diabetes, and tissue repair following strokes and heart attacks. Jason Ryndock, M.S., has worked as an Ecological Information Specialist with the Pennsylvania Natural Heritage Program since 2012, performing environmental review for the PA Department of Conservation & Natural Resources (DCNR) Bureau of Forestry in Harrisburg. His immersion in nature since childhood influences his research, creative pursuits, and hobbies. Jason received a M.S. degree in Biology from the University of Mississippi. This article originally appeared in the PA DCNR Bureau of Forestry’s weekly e-newsletter, Forest Fridays.